TOFU MOM . . . and gravy! : Vegan Christmas Baking: GINGERBREAD! 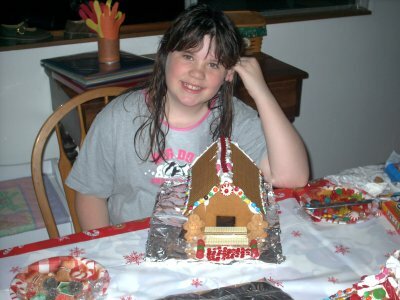 My daughter celebrates her birthday at the end of November every year with a "Gingerbread-House Making Party" for several of her (not so little anymore) friends. It's always a HUGE hit and the girls spend hours making beautifully (?) decorated little houses. In a large bowl beat together oil and sugar for about 3 minutes. Add molasses and soymilk. The molasses and soymilk won't really blend with the oil but that's ok. In a seperate bowl, sift together all the other ingredients. On a floured surface roll you dough out to a little less than 1/4 inch thick. You can do this in 2 batches if you don't have the space. Cut out your shapes with your cookie cutters and gently place on cookie sheets (if you are using them to decorate with remember to cut a hole with a straw or something before baking). Bake for 8 minutes.Remove from oven and let them cool for 2 minutes on the baking sheet then move to a cooling rack. Wait until they are completely cool before icing. 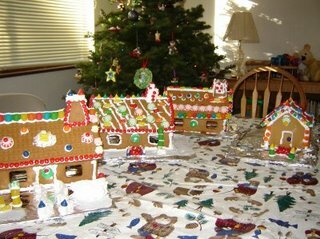 If baking "walls" for a gingerbread house, make cookies 1/2 inch thick and bake at 300 F until very firm - about 15 minutes or longer. Then let cook on a rack overnight. wow what a cute and pretty house! Thanks! We're getting set to have this year's gingerbread party on the weekend. I'll probably have pictures to post! YAY!